Laser tag HK-G36-CV «Bundeswehr» game set is based on UMAREX airsoft gun body, that has high reliability. The body is made from ABS plastic. 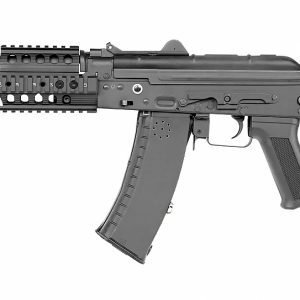 Players will appreciate HK G36CV for its original design. The model looks too realistic and its 4 Weaver rails allow player to mount different gadgets. You can change rifle length from 34in to 26in by folding a folding stock. Safety switch performs the power-on function. Reload is made by the breechblock. You will like a small weight and an autonomous work time of this Laser tag HK-G36-CV «Bundeswehr» game set.